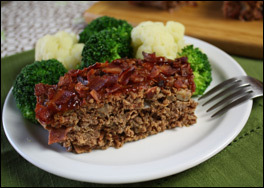 Just because you've got a soft spot for Mom's meatloaf doesn't mean you can't try a new recipe... Our Big Beef 'n Bacon Meatloaf is where it's at! Bring a large skillet sprayed with nonstick spray to medium heat on the stove. Add bacon and cook until crispy, about 4 minutes per side. Remove bacon and, once cool enough to handle, chop or crumble. Set aside. If needed, clean and dry skillet. Re-spray skillet and return to medium heat. Add mushrooms and onion. Stirring occasionally, cook until completely softened, 5 - 7 minutes. Remove from heat and, once cool enough to handle, blot away any excess moisture with paper towels. Transfer veggies to a large bowl. Add about three-fourths of the bacon, and set the rest aside for topping. To the bowl, add beef, tomatoes, 2 tbsp. BBQ sauce, salt, pepper, onion powder, and garlic powder. Mix thoroughly. Ooh, look at you, Denny's. You're so edgy -- you put bacon in unexpected dishes. Normally, we're cool with adding bacon to everything. (It DOES make everything taste better.) But when the food is fattening to begin with, and you add regular bacon, you're just getting fattening food + fatty bacon. ACK! 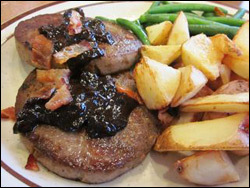 One look at the chain's sorry slabs of calorie-laden meatloaf, and we knew we could do better. Well, the Denny's people must've sensed we were coming after this dish with a slimmed-down swap in mind, because they've done away with the bacon-happy menu section. But that didn't stop us. Our recipe is packed with bacon and hickory-BBQ goodness. Plus it's got real homemade appeal. And isn't that partly what makes meatloaf so great? We bet you can think of five people right now who love bacon -- click "Send to a Friend" to pass along this recipe ASAP! Woohoo! It's the first day of summer. Fire up the grill and make these recipes -- it's the best possible way to celebrate!